I've said it before and I'll say it again, sweet and salty is my jam. In fact, looking over the recipes I've posted here you all may think I have a flaky salt addiction. Who am I kidding, you're totally right. My favorite treats are the ones that keep you guessing a little bit, the ones that hit your taste buds from all angles. When I was putting this recipe together I was feeling a little wild so I tossed in some smoked paprika at the end which ended up being a light, subtle background note, and who doesn't love a honey roasted pecan? Not this gal. p.s. Wow, wow! Thank you for all of the kind comments on my last post. I don't know what to say except, it's so nice to know that I'm not alone over here. 2. In a heavy bottomed pot combine the butter, water, honey, brown sugar and salt. Bring to a boil over medium high heat and cook for 5 min. Whisk in the baking soda and smoked paprika. 3. 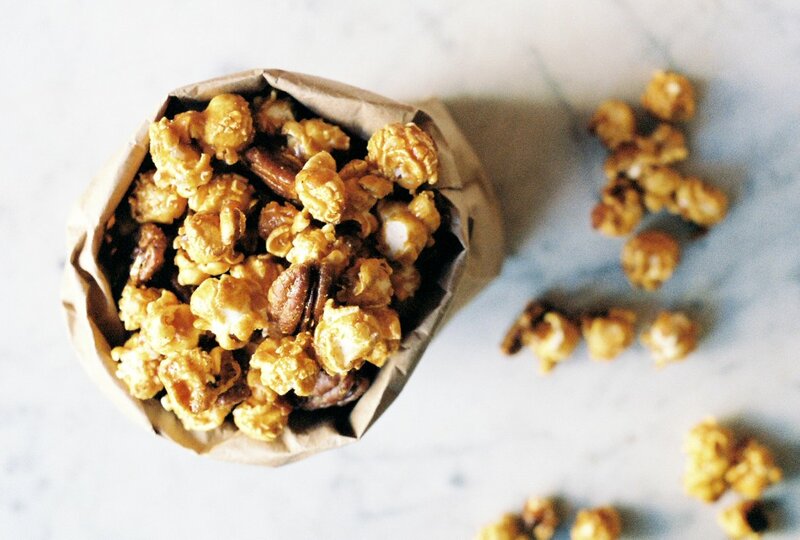 Pour the hot sugar mixture over the pop corn and pecans and stir well to combine. This recipe makes a lot of syrup, so don't worry about getting it all out of the pan. 4. Divide the mixture between the two baking sheets and spread into an even layer. 5. Slide the baking sheets into the oven and cook, stirring occasionally for 60min. Cool completely, then store in an airtight container at room temperature. - Check out this post for instructions on how to pop corn kernels on the stove, I love to use mushroom corn kernels for caramel corn.